The War Horse Memorial Anniversary Charity Ball. Ascot Racecourse, Saturday 8 June 2019. 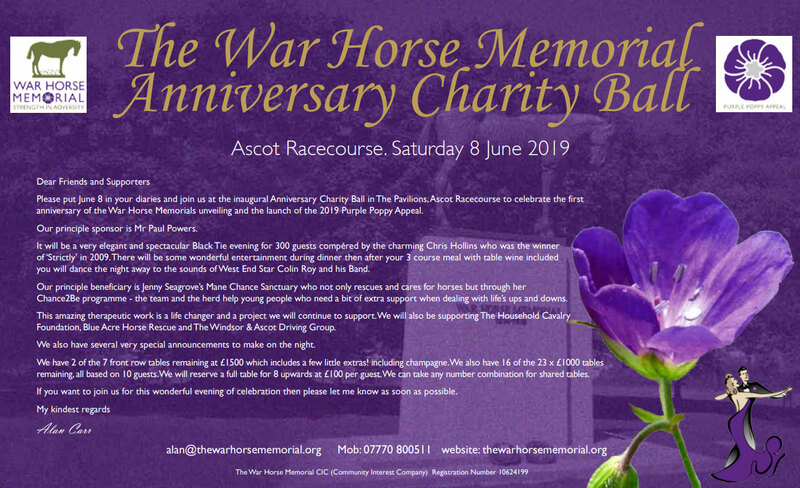 Please put June 8 in your diaries and join us at the inaugural Anniversary Charity Ball in The Pavilions, Ascot Racecourse to celebrate the first anniversary of the War Horse Memorials unveiling and the launch of the 2019 Purple Poppy Appeal. Our principle sponsor is Mr Paul Powers. It will be a very elegant and spectacular Black Tie evening for 300 guests compéred by the charming Chris Hollins who was the winner of ‘Strictly’ in 2009. There will be some wonderful entertainment during dinner then after your 3 course meal with table wine included you will dance the night away to the sounds of West End Star Colin Roy and his Band. Our principle beneficiary is Jenny Seagrove’s Mane Chance Sanctuary who not only rescues and cares for horses but through her Chance2Be programme – the team and the herd help young people who need a bit of extra support when dealing with life’s ups and downs. This amazing therapeutic work is a life changer and a project we will continue to support. We will also be supporting The Household Cavalry Foundation, Blue Acre Horse Rescue and The Windsor & Ascot Driving Group. We also have several very special announcements to make on the night. We have 2 of the 7 front row tables remaining at £1500 which includes a few little extras! including champagne. We also have 16 of the 23 x £1000 tables remaining, all based on 10 guests. We will reserve a full table for 8 upwards at £100 per guest. We can take any number combination for shared tables. If you want to join us for this wonderful evening of celebration then please let me know as soon as possible. *Update – only 10 of the 30 tables remaining!